This past week I ended up subbing for few days in a kindergarten classroom at my old job. I loved getting to see some of my sweet kids from my first year of teaching preschool and having the opportunity to see how much they've grown up and changed. While I loved the experience of subbing, it reaffirmed to me the reasons why I left teaching to pursue another dream. Not to mention, I totally forgot how messy my clothes got from teaching! It warmed up to almost 90 degrees this past week so I had to dig around for a tank top and spring coat. I went out for the evening so I decided to switch up my hair bow for a headband. I LOVE how this headband pops in my hair. Tomorrow, I get to put on my pink cowgirl boots and head out to the state fair. What fun things do you have planned for your beautiful Wednesday? Could you be any cuter??!! I love that yellow jacket and your cute Gussy ruffled headband. Love ya!! Adorable! Love the preppy green belt/pink shirt combo. I also live where it got up to 90 degrees this week. It's hard to dress appropriately! All I want is cords and scarves, but the weather tells me I should still be in sundresses. and LOVE your yellow coat too! I just ordered two gussy headbands and i can not wait to get them! yours is way cute. 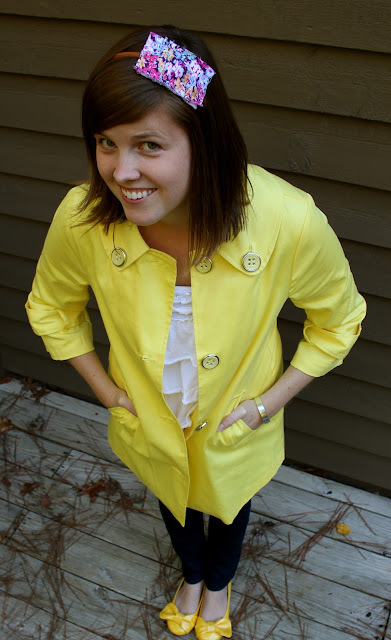 Cute yellow coat! So bright and cheerful! love those sparkly toms! i am obsessed with anything sparkly these days... and that yellow coat is so fun!! I love that you have SPring coats. I want to be in your closet. Fabulous yellow shoes. Oh- and the Gussy. Lovely. ;) Miss you sweetie! I love your yellow shoes!